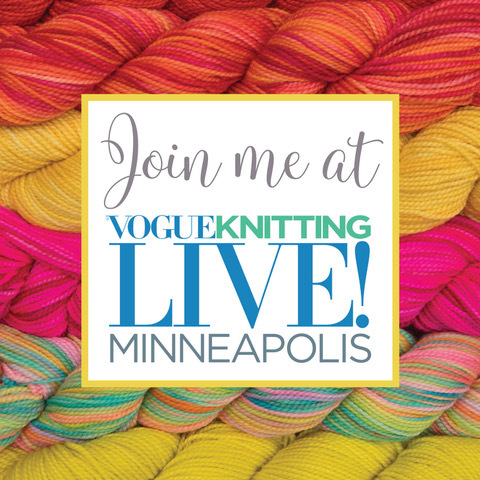 Kelbourne Woolens at Vogue Knitting Live - Minneapolis! I just returned from Vogue Knitting Live in San Francisco, which was my first teaching foray post-baby! It was a success, and I’m busily preparing for Vogue Knitting Live in Minneapolis. If you’ve never attended a VK Live, I highly recommend it. It is one of my favorite events to teach at, and the events staff, teachers, and marketplace are top notch. 3 Kittens Needle Arts will have our yarns in the marketplace as well, and we’re very excited for that! This is my second time to Minneapolis, and I have to tell you, the knitters up there are some of the best. I taught Bohus there a few years ago, and had to make the students a more difficult chart at my lunch break! That is how good you Minnesotans are. I love a challenge, and with 3 more years teaching under my belt, I AM READY FOR YOU! The Swedish workshop founded by Emma Jacobsson, Bohus knitting, is best known for its beautiful hand-knitted items made famous in the late 1930s through the ‘60s for their attention to detail, innovative design and color, and exacting standards of craftsmanship. Traditional Bohus patterns utilized a fine-weight angora and wool blend to create a gorgeous halo and tonal gradations of color. The addition of purl stitches and the sometimes third—or fourth or fifth—color per row opened up limitless design possibilities for the knitter. In this class we will learn a bit about the history of Bohus knitting, as well as the technique used to create its masterful effects. My favorite part of this class is the slide show! I have a collection of original Bohus Stickning garments and ephemera (images only) from the Bohuslan Museum to share as we discuss the history of this amazing women's cooperative. This class is a full day, but a joy to teach. I’ll have new samples to share with students which I’m very excited about! I love, love, love working from charts - and you will too! No, really, I promise. This class goes over the basics of working lace from a charted pattern, including reading a chart key, counting stitches, checking gauge, how to decipher individual stitches, checking to see if mistakes have been made, how to fix mistakes after the fact and working multiple repeats in a single row. Through informative anecdotes, in-class demonstrations, and a healthy does of humor, we guarantee you will not only learn to knit lace from charts, but love doing so! As an added bonus, students in this class will be getting a super special yarn to work with! Shhhh…. you’ll have to keep a secret! Roositud is an Estonian inlay technique where a contrasting color is wrapped between the back and front of the fabric as you knit. The end result is geometric patterning on the knitted fabric that resembles embroidery. Using the Roositud technique allows you the freedom to place a motif anywhere and to use as many colors as you wish, allowing for almost limitless design possibilities. This technique is really fun to do, and it’s much easier than it looks. You’re only ever knitting with one color, and the “embroidery” part is done as you knit! It’s kind of magical. I love teaching this class, and it’s definitely an interesting technique to learn, especially if you’re interested in obscure knitting practices, like I am. I will have a few new samples to share in class which I’m also very excited about, and I’m knitting them now in Sunshine Yellow - which I hear is the color for fall, even if I don’t look great in it. I’m going to wear it anyways. Tl;dr: Take this class if you’re a knitting nerd. When I’m not in class, you’ll find me hanging out in the 3 Kittens booth, or making my way to the Herbivorous Butcher! Anyone care to join me on a vegan adventure? I have a lot of sandwiches to eat. See you at VK Live!